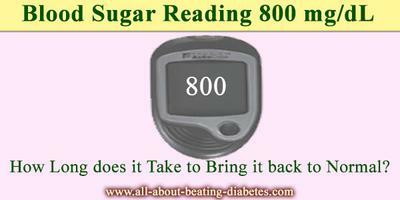 How long does it take to reduce a reading of 800 to get back to a normal range? QUESTION: How long does it take to reduce a reading of 800 to get back to a normal range? Is hospitalization necessary to get it down? 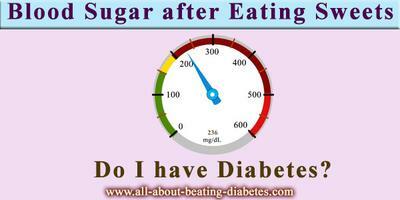 First, I want to remind you the normal blood glucose concentration, which varies from 64.8 up to 104.4 mg/dl. As you may see, your blood glucose concentration in this moment is about 8 times higher than normal. Generally speaking, a slight elevation of the blood glucose level, like 200, can be compensated without medical attention, by diet, exercises and usage of medications. However, severe elevation, like the one you have requires immediate medical care, because it has to be reduced constantly. So, my advice for you is to visit the emergency and to inform the medical staff about your problem. Then, insulin, solutions and a diet will be applied on you. In general, it requires to stay about 3-4 days in the hospital, but remember that you will have to put your blood glucose concentration under control in purpose to avoid the existence of such high readings. I want to also remind you that such high blood glucose level might lead to ketoacidosis and other life-threatening conditions, which means that it is dangerous. Please go to the emergency or talk with your health-care provider immediately!!! Your case is an emergency. In addition, I want to inform you that sometimes the inadequate execution of the blood glucose test can lead to false positive result, like this one. However, in purpose to be sure if this result is real, other tests have to be executed. I hope that everything will be alright, please let us know about your health situation after taking the right treatment? High glucose readings 27.3 up to 33.6 mmol/L for the last week! QUESTION: My readings have been very high for the last week or so, I am getting readings of 27.3 up to 33.6 mmol/L. What is the end result of these readings? It is true that your blood glucose readings are very high, because the normal blood glucose concentration varies from 3.5 up to 6.1mmol/l. In addition such elevation requires immediate medical attention. So, you have to visit your doctor as soon as possible. Just for your information, the long-term elevation of the blood glucose concentration can lead to diabetic ketoacidosis and hyperglycemic hyperosmolar state. Those conditions are life-threatening and they can lead to come and death. Because of the risk for your life, my advice for you is, to seek immediate medical attention. In most cases, such elevation speaks about diabetes. However, the confirmation of this diagnose requires several other tests, which only your doctor can execute. I don’t want to scary you, but generally, persistent elevation in the blood glucose concentration like in your case, will lead to blood glucose lowering therapy, i.e. 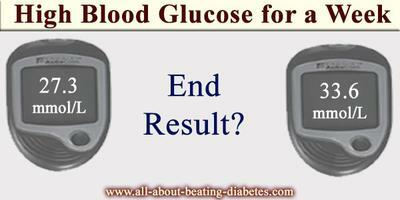 you have to take pills or shots permanently in purpose to keep your blood glucose within the normal ranges. Something important is that you haven’t mentioned your gender. This is important, because sometimes the pregnant women develop gestational diabetes. This type of diabetes leads of course to blood glucose elevation, but in general this elevation requires blood glucose lowering therapy until the end of the pregnancy. So, if you are pregnant, speak with your doctor about this. QUESTION: I am normal and not got blood sugar above normal anytime but I ate one icecream, 2 malai cake and strawberry syrup, 2 chammach a day prior to test of blood sugar and result was 236. Does it mean I have diabetes? At first, I want to inform you that diagnosis of diabetes is determined by three main tests: fasting blood glucose test, oral glucose tolerance tests and A1C test. These results of those tests are providing complex information about the glucose metabolism of every patient, who is suspected of having diabetes. Besides this, I want to ask you: how long after the consumption of those sweet products mentioned above you have measured your blood glucose concentration. This is very important, because the blood glucose concentration of every patient varies during the day and it is changing according to the insulin production and the amount of glucose acquired. So, if you have measured your blood glucose just right after the consumption of those meals, it is normal to have such elevation. This means that you don’t have diabetes, because this glucose elevation is physiological. 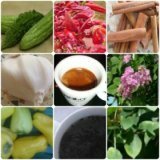 Besides this, if you have eaten them at bed time or near by bed time, the organism was unable to metabolize such glucose load and of course some of it gets accumulated in your body, resulting in elevated blood glucose level. However, just for precaution, I think that it would be better for you to execute the tests mentioned above. These results are going to define correctly the status of your glucose metabolism. But remember, before those tests, you have to follow strictly the instruction given by your doctor. Something else, which can help you with this, is that diabetes is characterized by early symptoms: drinking plenty of water, frequent hunger and urination. It is probable for you to have diabetes, if those tree symptoms are presented. However, the tests results are going to show your true health status.